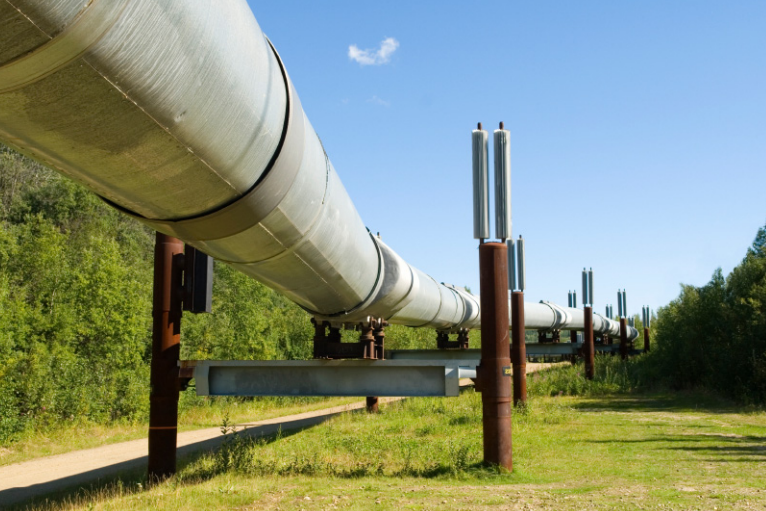 Pipelines are used to transport petroleum products and natural gas across long distances in cold environments. Because of this, petroleum mixtures may need to be preheated after being transported in pipelines before a refining process can begin. However, as the oil is pumped through the pipeline, heat is generated from the fluid itself as it flows. To keep costs down and the heat inside the pipe, the pipeline insulation can be optimized using models and simulation. Pipelines are an economic approach to transporting fluids like oil, natural gas, and water across land and sea, though they are expensive to build. These structures are comprised of steel or plastic tubes that are typically buried or run at the bottom of the sea, with pump stations distributed throughout the system to keep the fluid moving. As a petroleum mixture is pumped through a pipeline, it generates heat as a result of internal friction forces. The origin of this heat is the energy supplied by the pump. This heat is quickly dissipated if the pipeline runs through cold environments. Eventually, the temperature of the mixture reaches the same temperature as that of the environment, if the pipeline is not insulated. At lower temperatures, oil becomes more viscous, which increases the energy consumption of the pumps. On top of that, cold petroleum mixtures require preheating before they can be used in the refinery. The preheating process consumes energy and requires investment to build and maintain. Pipelines are used to transport fluids throughout the world. It is an easy and obvious thing to insulate a pipeline to avoid the decrease in temperature of the oil by keeping the energy supplied by the pumps inside the pipe. The trick is to insulate the pipeline well enough, but not more, so that the return on investment motivates the cost of the insulation. If the petroleum mixture temperature can be kept at a high enough level, the cost of the preheating process can be eliminated and the pump’s energy consumption can be reduced substantially. The reduction of theses costs have to motivate the investment in insulation. The fluid flow and heat transfer processes in the pipeline can be modeled and simulated accurately using the COMSOL Multiphysics® software. 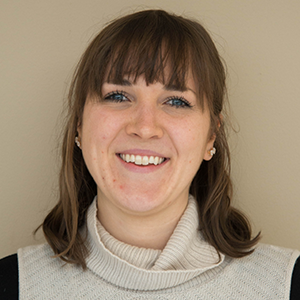 The models can be used to design an insulation that is as inexpensive as possible, yet as efficient as required to keep the oil at the desired temperature. Our Insulation of a Pipeline Section tutorial model features a 150-km pipeline section that has an inlet temperature of 25°C. The oil that enters the pipeline flows at a rate of 2500 m3/h. To set up and solve the energy and flow equations that describe the transport of the fluid within the pipeline, we use the Nonisothermal Pipe Flow interface. This particular case involves analyzing one pipe wall and one insulation layer, as highlighted in the schematic below. Here, the dark and light gray layers represent a two-layered wall, while light blue represents the film resistances on the inside and outside of the walls. Note that the pipe wall is 2 cm thick in this example. 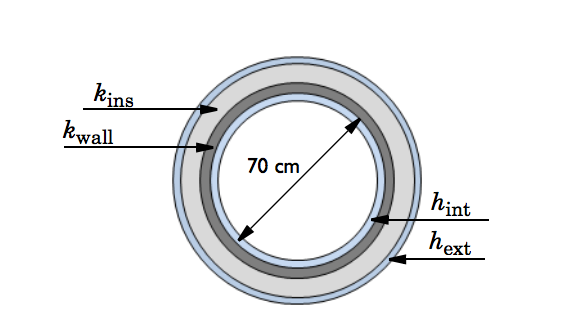 Schematic of the pipeline cross section, where hint and hext are the film heat transfer coefficients inside and outside of the tube and kins and kwall are the thermal conductivity of the insulation and the wall, respectively. In the first study, we calculate the temperature along the pipeline for two different cases: one where perfect insulation is assumed and one where the pipeline has no insulation. The plot below shows that the heat resulting from friction forces in the fluid causes its temperature to increase by about 3°C over 150 km. When no insulation is added to the pipeline, the outlet temperature is similar to that of the surroundings. Plot comparing the fluid temperature when there is perfect insulation on the pipeline (green) and when there is no insulation (blue). With an understanding of the fluid flow and heat transfer processes, we can perform optimization calculations to identify the minimum insulation thickness required to keep the oil temperature at a constant level throughout the pipeline. 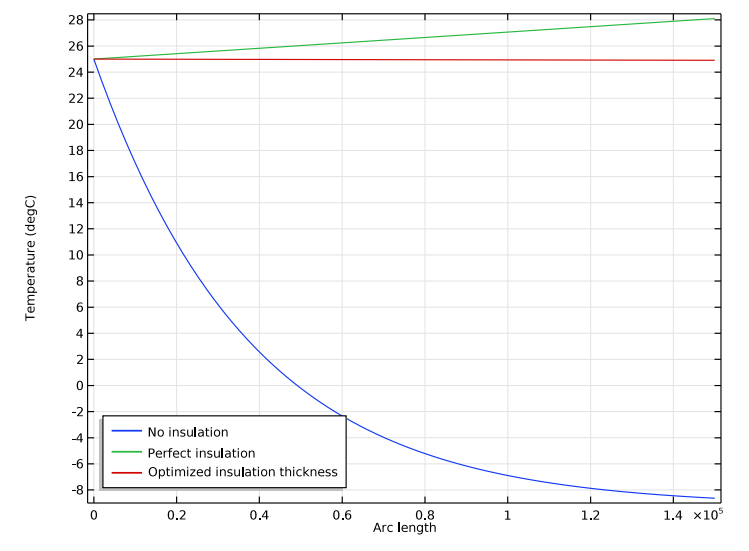 The results from this particular optimization study indicate that the minimum insulation thickness is around 8.9 cm. We could also perform a similar optimization study, but for a minimum acceptable oil temperature level at the end of the pipeline, which could potentially reduce the insulation thickness (and the cost) even more. Based on the calculated minimum thickness for the insulation, we may estimate the investment costs and decide if these costs are motivated by the reduced pumping and preheating costs. We can potentially reduce energy consumption in the pumping process and eliminate it for preheating, making the process more efficient and environmentally friendly.